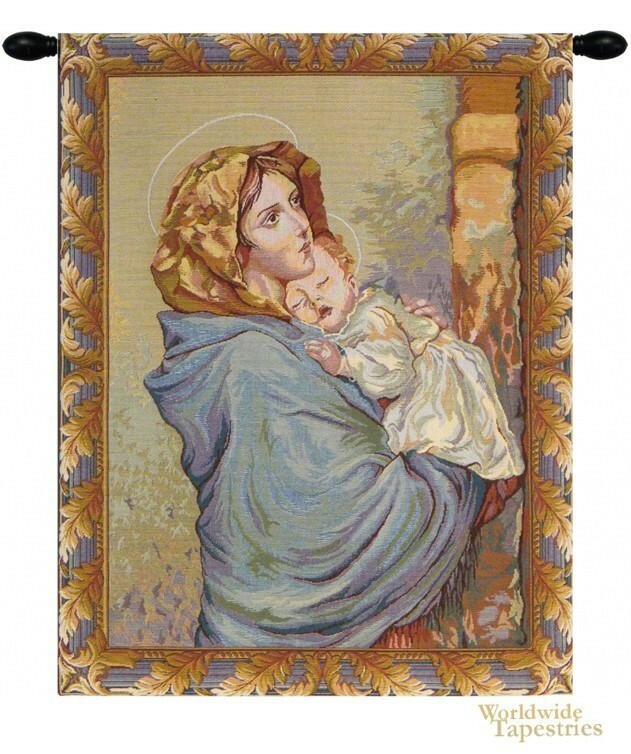 The work of Roberto Ferruzzi, the Madonnina, or The Madonna of the Streets, was first exhibited in the Italian artist’s hometown of Venice in 1897. Once believed to have been a rendition of the Blessed Mother, the subject is actually Angela Cian, who was spotted by Ferruzzi as she carried her baby brother. Because of her youth – Angela was 11 at the time – he called his painting Madonnina, or “Little Madonna”. When Angela returned home that day her mother explained that proper young ladies do not pose for portraits, so her identity remained a secret until her death in 1972. The story behind the work only adds to its beauty today. This tapestry is lined and has a tunnel for easy hanging. Note: tapestry rod and tassels, where pictured, are purchased separately.